Evolution is a great tinkerer, and when cells discover a useful plan for a protein, it is often pressed to service in other capacities. The DNA repair protein AlkB is a perfect example. 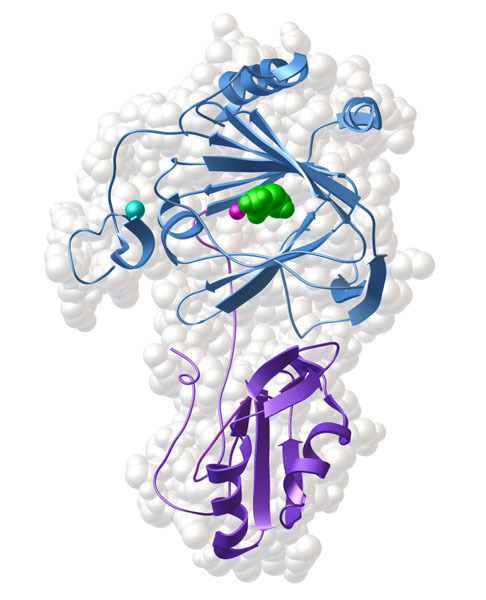 AlkB (shown here in a complex with DNA from PDB entry 3bkz) is a bacterial protein that has the remarkable ability to repair DNA bases that have been damaged by alkylation. Many of the repair mechanisms used by cells need to clip out the damaged regions, then rebuild the entire region. AlkB, on the other hand, does a quick fix and restores the base to its proper form. With the help of an iron ion, molecular oxygen, and a small cofactor, it adds an oxygen atom to alkylated bases, forming an aldehyde that spontaneously dissociates from the DNA. Looking in human cells, researchers have found eight proteins homologous to AlkB, which are thought to have arisen through evolution from a common AlkB ancestor protein. 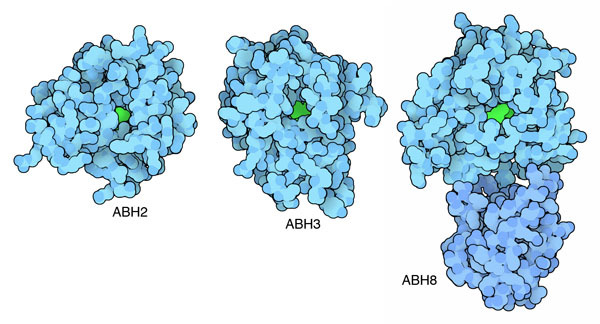 Researchers are now revealing the structure and function of these AlkB homologs, called ABH proteins. Two of them, ABH2 and ABH3 (shown here from PDB entries 3bu0 and 2iuw) perform a similar function of repairing alkylated DNA bases, and have structures closely similar to AlkB. ABH8, on the other hand, has a quite different function, and some unusual modifications to the structure. AlkB and ABH2 are quite promiscuous, repairing a range of different types of alkylated bases in DNA and RNA. ABH8, on the other hand, has a very specific function: it modifies one base position in a transfer RNA molecule. ABH8 contains two separate enzymes: a methylase and an AlkB-type dioxygenase. Together, they build a complex modification onto uridine bases in the wobble position of the tRNA anticodon, refining its function in protein synthesis. PSI researchers at NESG have recently solved the structure of the AlkB portion of ABH8, shown here from PDB entry 3thp. The structure also includes an additional domain (shown here at the bottom) that is important for interaction with tRNA. AlkB and ABH8 have similar catalytic machinery, composed of an iron ion and the cofactor 2-oxoglutarate, all held in the active site by a similar protein fold. The differences are in the regions surrounding the active site. AlkB has several long, flexible loops that surround a variety of different damaged bases, performing the corrective reaction. ABH8, on the other hand, has smaller versions of these loops, which are disordered in this structure due to their flexibility when not in complex with tRNA. ABH8 also includes an additional zinc ion and the attached RRM domain, which are important for interaction with its large tRNA target. 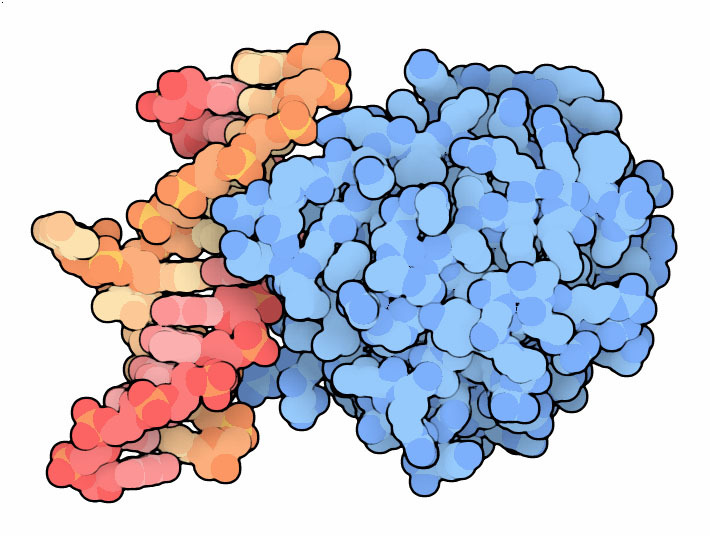 To compare the structures of these proteins, the JSmol tab below displays an interactive JSmol. AlkB and the dioxygenase domain of ABH8 share a similar protein fold and a similar active site. In this jmol, the dioxygenase domains are in blue and the RNA-binding domain of ABH8 is in purple. A magnanese ion, which is in the position normally occupied by iron, is in magenta and a zinc ion is in cyan in ABH8. The small molecule in green is the cofactor 2-oxoglutarate. In the AlkB structure, the alkylated base is in bright red, and has flipped into position in the active site. Pastore, C., Topalidou, I., Forouhar, F., Yan, A. C., Levy, M. & Hunt, J. F. Crystal structure and RNA binding properties of the RNA Recognition Motif (RRM) and AlkB domains of human AlkB Homolog 8 (ABH8), an enzyme catalyzing tRNA hypermodification. J. Biol. Chem. 287, 2130-2143 (2012). Yang, C.-G., et al. Crystal structures of DNA/RNA repair enzymes AlkB and ABH2 bound to dsDNA. Nature 452, 961-966 (2008). Sundhein, O., et al. Human ABH3 structure and key residues for oxidative demethylation to reverse DNA/RNA damage. EMBO J. 25, 3389-3397 (2006).